This handy Noble Products wall mount glove rack is designed to hold 3 glove boxes for easy one-at-a-time dispensing. Every business has had to deal with misplaced gloves at some point. Not only does it slow things down, but it also looks bad to customers. With this convenient rack, you can eliminate the possibility of cross contamination from counter tops while ensuring that your staff always knows where the gloves are for a more efficient operation and an improved customer experience. This glove dispenser is of awesome quality. It’s so cheap for the value of what you get! We especially valued that the screws and everything to hang on the wall was included. This is a great sized rack that fits most brands of gloves. The wire is a bit flimsy when hung, so it definitely needs to be mounted. The little label tabs are great to write sizes. I use a dry erase marker for this. I would recommend this product. I love this glove holder. We keep Med/large/X-large and now there is no searching for the box of gloves wondering where someone moved them to. It saves a ton of table space and overall makes things move faster since we no longer have to search for them. It’s sturdy and has a place where you can write the size. We turned ours sideways to accommodate a shelf above it and it still works well. Perfect size for our medium, large, and extra large gloves. A great way to stay organized. We mounted this right to the wall and the employees always know where to get their gloves. Perfect fit for my noble vinyl gloves. This is nice to get glove boxes off the counter and out of the way and fits nicely on the wall. Sure you install it on the right side or else it’s very annoying to use. Otherwise it works for you . Would purchase this item again. Just recently purchased two of these. We use to have all of our gloves on shelves and have since hung them up out of the way with this wire mount. Has been a great addition to organizing our kitchen. This rack keeps your gloves nicely organized in one convenient spot. I wish it would hold 4 boxes though so I could have the XLG with the others. The rack fits nice and easily to the wall with the supplied hardware. The glove boxes fit in as they should and will not fall out, even if the rack is pushed. Quality product at a low price! This is the type of item in a kitchen that we did not realize how much we needed one until we had one in place. It works wonderful at keeping the boxes all in the same place and allows you to see when the box is almost empty. This is a very nice rack, seems to be powder coated to prevent rusting and corrosion, there are front plates which you can make your glove size. Easy to drop a new box in at any time. This Noble 3 box wire wall mount glove rack is great. It holds three boxes of gloves at a time. This is awesome for our High School culinary classroom as students can have easy access to all of the sizes of gloves at once. So happy with this purchase! We have this rack in our kitchen at the restaurant. It holds different types of gloves and it is very sturdy. It was put up on the wall with ease. This glove rack holder makes it convenient to grab a pair of gloves in a hurry. Comes with screws for mounting on the wall. Great product at good price. Fantastic! We have these throughout the ice cream shop. Holds 3 different boxes of gloves so we always have small, medium, and large gloves at every station. Keeps boxes off of shelves or laying around. All employees know exactly where to find gloves. Makes it easy! We have a small kitchen and space is always an issue; before we got these, the box of gloves would be on one table and then someone else's table, taking up space, taking up time sharing the boxes back and forth. I installed one of these on each wall in front of our prep tables and yay, no more space taken up on our tables! Heavy duty write frame holds three boxes of gloves well. It comes with the hardware necessary to attach the frame to the wall. Definitely recommend. A nice glove rack for the price. Hard to beat the value. My only complaint is that it doesn't attach to the wall as firmly as I would like. It has a bit of flex when you're pulling out the first glove in a new box, but that is a minor quibble. We at Jefferson Rural Clinic love this economical and highly functional glove dispenser! We can replace one size/style at a time without moving other boxes of gloves, it cleans easily, and sturdy enough for 3 full boxes. Mounts very easily. We love this thing. It is so easy to make sure that all our gloves stay organized for our staff. We seem to have, in three employees, three different sizes of hands. 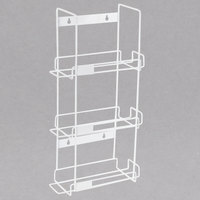 This 3 box glove rack is ideal for mounting on a wall to keep your boxed disposable gloves organized and out of the way. Mounts easily with the included screws and hold standard size glove boxes nicely. holds all our gloves, no matter the type, poly, vinyl ect, it all fits. Clean easy install , just screw it up anywhere you need gloves. This is super handy. It holds 3 boxes of gloves, I have several boxes that vary slightly in size, and they all fit inside the slots. It comes with four screws, which seems to easily hold the weight of the full boxes. If you want your employees changing their gloves often, then this rack is a must have. It also accepts many different sizes of boxes, so if you change styles, it still works well. i always wanted to invest in this glove rack and i finally did, i love how easy it is put up and now my gloves won't be all over the place. Nice and durable for your gloves. We hung this on the wall for easy access for all employees to use. Holds 3 boxes nice and secure. We needed a rack to hold our gloves in our new Food Truck and not take up space. This solves space problems and couldn't be happier. We use this in our establishment because we have three glove sizes to accommodate. We have it hanging up on a wire shelf with hooks, so it's flexible in it's hanging! I wanted a rack for our disposable gloves that I could wall mount for easy access and to keep them off the counter or shelf. Having 3 racks allows us to have 3 different sizes on display for easy access. The rack is designed so you can insert a box from one side. My only thought is it would be nice if this was somehow reversible so you could insert from either side. Luckily we found a spot that it works great for us inserting from the left side only. These wall mounted glove racks provide a food safe place for glove storage. They are convenient to hang around the kitchen, and prevent boxes from ever having to touch work stations. This is an inexpensive, easy to use product that keeps gloves and hairnets neat and organized. Mounts easily on the wall and looks great. Highly recommend. We have 4 sizes of gloves but 3 are used the most. this works out great for us in our small kitchen. The cooks don't have to look to see what size they are grabbing cause we put them in order from smallest on the bottom to largest on the top. This works well for putting gloves in a convenient location on a wall instead of taking up counter space, and it is easy to install. The Nobel Products 3 Box Wire Wall Mount Glove Rack saves space, and is easy to mount. The glove boxes containing various sizes of gloves, slip into the holder easily, and aids in the quick dispensing of the gloves for my employees to utilize. Great Product! The glove holder is very handy and easy to hang up. It makes it very nice to be able to grab the size of gloves you need when you want. A little bit flimsy. We ordered three of these to keep gloves at hand for all our team . One arrived with the weld broken between the rack part and wall mounting plate. The other two have held up after being installed. This wall mount fits a box of gloves perfectly. It was easy to install and fits into small spaces. I like it because it is white. Decent glove rack. It is wire so it is not extremely sturdy or durable, but if mounted to a wall holds normal sized boxes of gloves just fine.